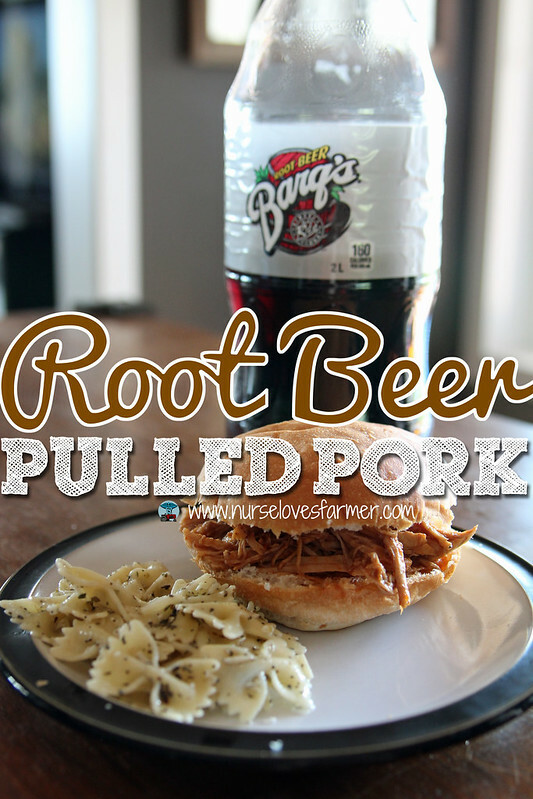 Look no further for the perfect root beer pulled pork sandwich. With very little prep, all you need to do is let this roast simmer all day in the crock pot, make your root beer sauce a half hour before you serve and voila! Trim some fat from the meat, but this will cook off as well, and cut the meat if necessary to fit in your slow cooker. 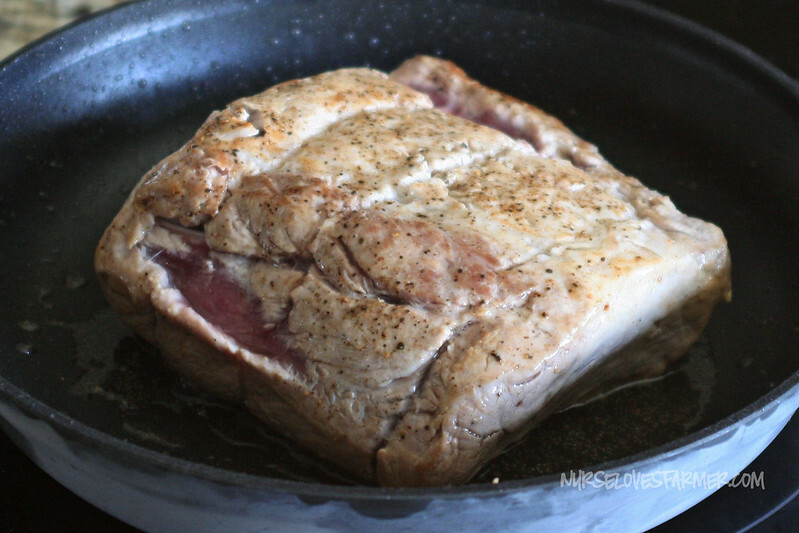 Sprinkle the pork with salt & pepper and heat up the canola oil in a large skilled. Brown the meat on all sides and drain off the fat. Cut your onions into thin wedges and add your meat, onions, 1 cup of root beer (not diet root beer) and garlic to the slow cooker. Cover and cook on low-heat for 8-10 hours or high for 4-5 hours (slow is always best!). As your meat is simmering all day you can mentally prepare to make the sauce. I make this about a half hour before I’m going to serve supper. In a medium saucepan combine the remaining 3 cups of root beer with the chili sauce. I use Heinz bottled chili sauce, but I also wanted to note that last time I made this I only had half the amount I needed. I improvised and added a squirt of ketchup and filled the rest of my cup up with a Thai sweet red chili sauce (I use this one) and it was probably the best pulled pork I’ve ever made. It was also the first time I used root beer concentrate as I’ve never been able to find it until now. I found mine at the till in a Bulk Barn store, you can also buy it online and it gave it a really great burst of flavour. Bring the sauce to a boil and reduce heat. Boil gently, uncovered and stir occasionally for about 3o minutes or until the sauce is reduced to 2 cups. Feel free to add a splash of hot sauce, though I never do. 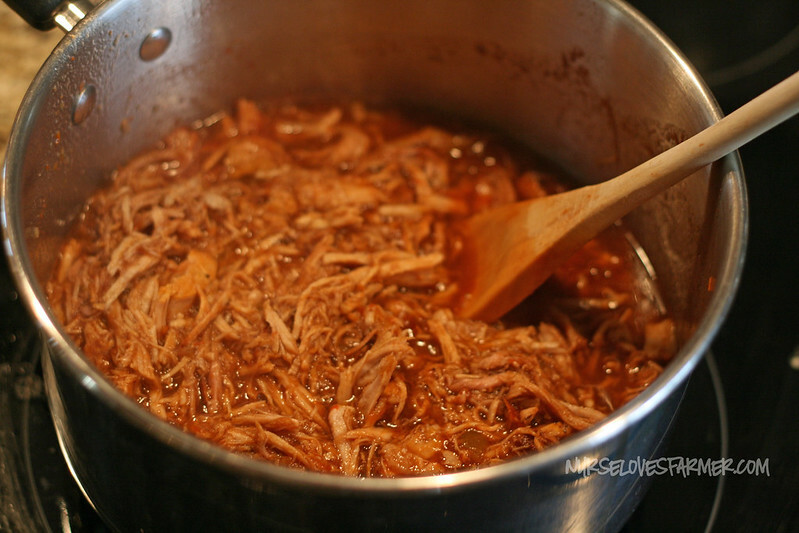 You can transfer meat (leave the onions in the slow cooker) to a cutting board to pull apart the pork, or just do what I do and skip a step and some dishes, and transfer pork directly to saucepan and pull apart in the sauce. Use a slotted spoon to remove the onions from your slow cooker and use them on your sandwiches if you please. Discard those juices. Also use a slotted spoon to scoop up some pork to put on your sandwich. Toast your buns, add some lettuce, tomatoes, cheese—whatever you please! 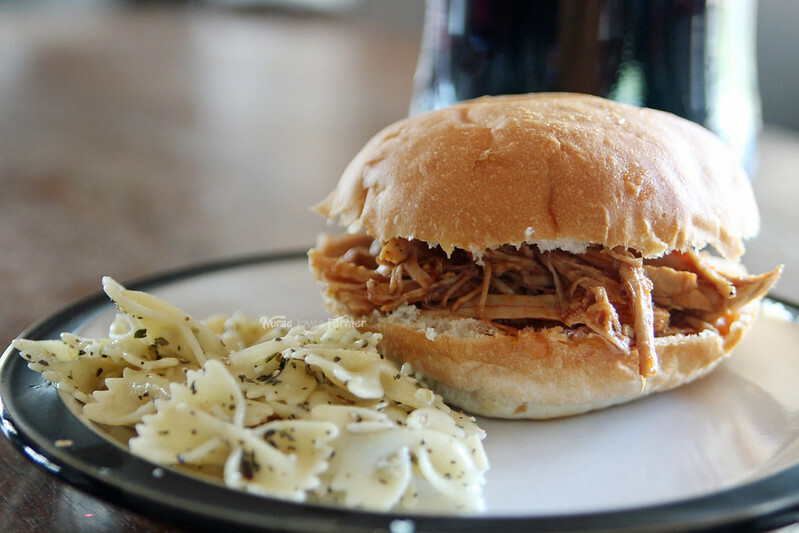 Look no further for the perfect root beer pulled pork sandwich, easily made in your slow cooker! Great for large crowds. Trim fat from meat and, if necessary, cut meat to fit in your slow cooker. Season meat with salt and pepper and warm canola oil in large skilled on stove top. Brown meat on all sides in skillet and drain fat. 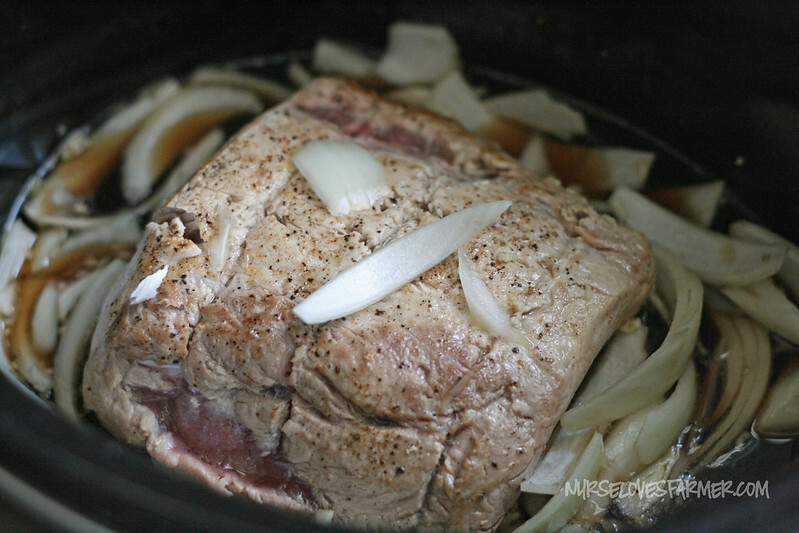 Transfer meat to slow cooker and add onions, minced garlic and 1 cup of root beer (not diet). Cover and cook on low for 8-10 hours (recommended) or high for 4-5 hours. A half hour before you want to serve, in a medium saucepan combine the remaining 3 cups of root beer and the chili sauce. Bring to a boil and reduce heat; gently boiling and stirring occasionally for about 30 minutes or until sauce is reduced to ~2 cups. Add in your root beer concentrate and hot sauce if desired. Transfer meat to cutting board to pull apart, or if you want to skip this step, transfer directly to sauce in sauce pan and pull apart there with two forks. Scoop onions out of slow cooker and discard juices. To serve, line buns with pork, lettuce, tomatoes, cheese---whatever your heart desires! Try substituting ½ cup Thai sweet red chili sauce with ½ cup of bottled chili sauce instead of the full cup of regular chili sauce. Recipe adapted from Better Homes & Gardens New Cook Book Limited Edition. This is a favourite recipe of ours and it’s really awesome and easy for large crowds. Serve with a salad of your choice, perhaps some fries and corn on the cob! Any thoughts on taking this to Instant Pot? I tried this the other night and it was AWESOME!!! Thanks so much for the amazing recipe!